Product #21948 | SKU HD400 | 0.0 (no ratings yet) Thanks for your rating! 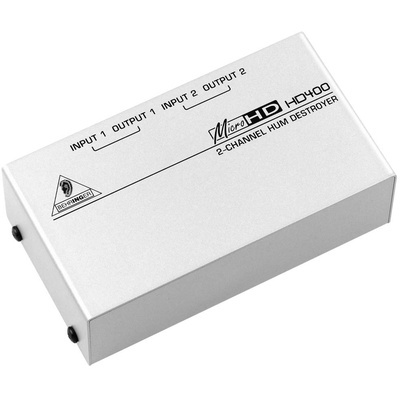 The MicroHD HD400 from Behringer is an ultra-compact two-channel hum eliminator that removes AC hum and noise quickly, easily and reliably. Ground loops can be safely broken while the unit automatically converts unbalanced signals into balanced ones without any signal loss. The HD400 can function as either a discrete two channel device or for stereo audio. The unit is a passive device and does not require an external power supply.